Bourbon Trail Bed and Breakfast; AirBnB; Hunter's paradise; home to your small business. This dream home offers a world of wonderful options! Secluded luxury living at its finest. Just 25 minutes to downtown Louisville. 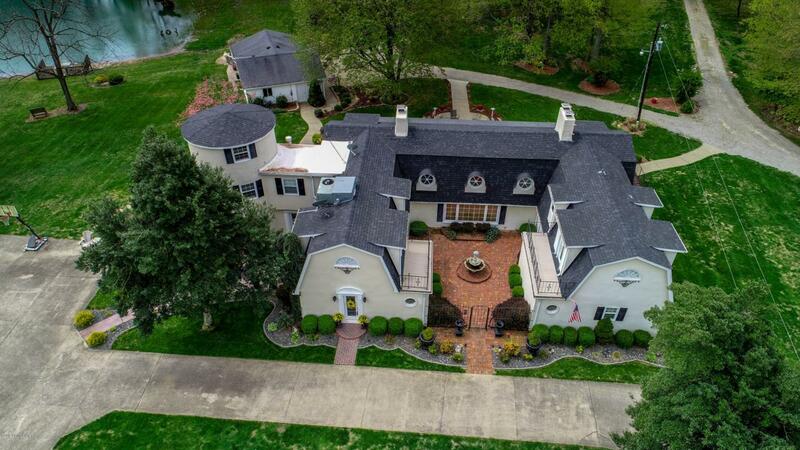 This 4-5 bedroom 3 1/2 bath estate sits on 24 acres backing up to Bernheim Forest. 21 acres is zoned ''light industrial'' which makes it a fantastic option if you would like to run a business just steps away from home. (Talk about an easy commute!). The moment you walk through the courtyard into this sprawling estate you will be WOWED! This home features two separate wings. The owners wing includes a Master Bedroom with in-suite bathroom, a second floor room that leads up to a 3rd story tower, and a private loft that overlooks the entire great-room.The fifth bedroom has been converted into a HUGE walk-in closet. A massive 900 square ft 4 seasons Florida room enclosed in glass runs along the back of the house offering great views of the beautiful wooded property. At the other end of the house you will find the second wing. This space consists of its own private entry off the courtyard making it a possible Bed and breakfast home. Upon entering, you walk into a beautiful foyer with a bedroom, full bathroom, and office. Upstairs you will find another full bath and 2 more bedrooms, both with private balconies. The amenities and attention to detail in this home are incredible. Other noteworthy features include 3 fireplaces, a generous size kitchen including a beautiful center island and an adjacent butler's pantry that provides more cabinet space then you could ever dream of. This is truly a wonderfully unique property with so much to offer! Call to schedule your private showing today!